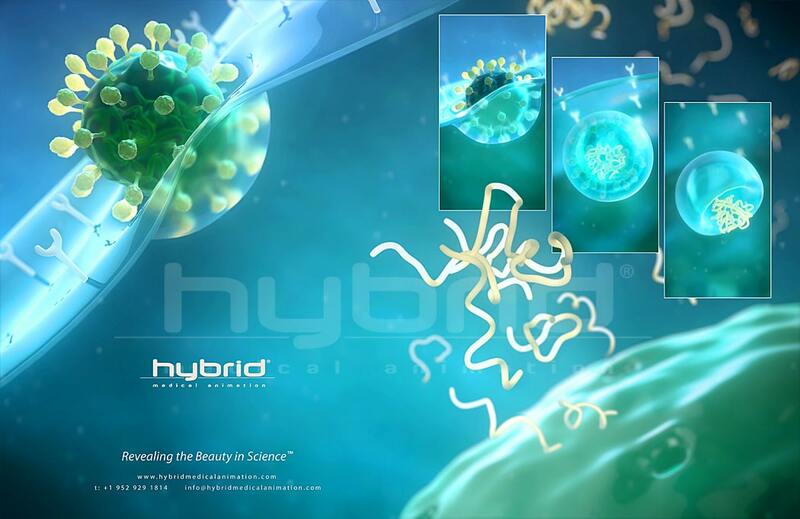 Series of illustrations showing an influenza virus merging with a cell membrane and releasing its genes into the host cell. This image was created for entry into the upcoming Medical Illustration Sourcebook page and other promotional purposes. These are also stills taken and recreated from part of a massive animation project created for the Daiichi Sankyo Kusuri Museum, which opened in Tokyo in February of 2012. The museum offers an entertaining, “experienced-based” learning opportunity to visitors, introducing the highly specialized field of medicine in an accessible, easy-to-understand way.